How many Cloud licenses am I using, and how can I tell which machines are on the waiting list? When you log into your Cloud account, you will land on the “License Status” tab. This tab tells you several things—how many license you bought, how many you’re using, and how many machines are on the waiting list. 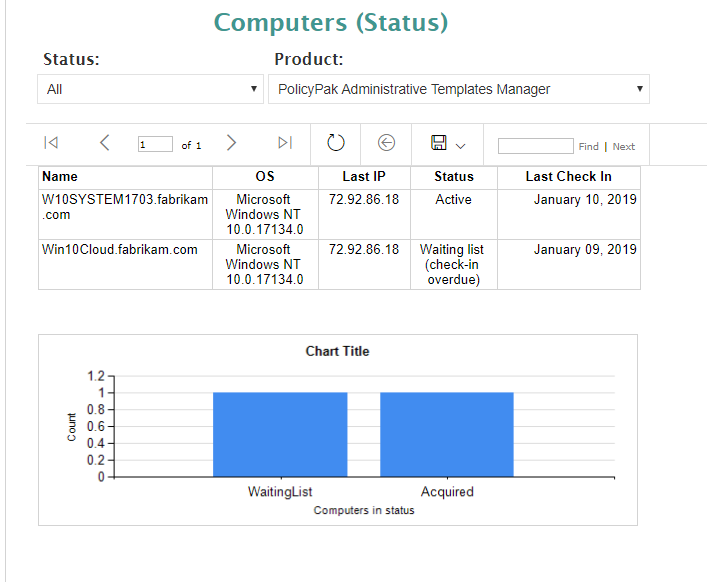 The number in the “Total Purchased” column tells you how many licenses you purchased from us here at PolicyPak—that’s the maximum number of computers you can have synched with the cloud at any given time. The number in the “Consumed” column tells you how many licenses have been consumed—how many of your machines are correctly connected and synched with your cloud instance. The number in the “Waiting” column tells you how many computers are on the waiting list—that is, how many machines tried to check in when all of the available licenses were consumed, and therefore couldn’t sync with the cloud and receive directives. Another reason a machine might be “Waiting” is because the computer has been offline for more than the required refresh period (usually 7 days). Computers which have been offline more than 7 days go into “Waiting” status. If there’s an available license when they come back online, they will claim an available license. If a licensed computer goes offline or does not communicate with the PolicyPak Cloud service for 7 days or more, then it will relinquish its license and that license will return to the pool, where a computer on the waiting list could consume it. To find out which of your machines have consumed a license, and which ones are on the waiting list, go to the Reports tab, located next to the “License Status” tab. The chart shows you in graphic form the same thing that the “License Status” tab told you in numerical form. However, above that, you’ll find a list of machines that either have consumed a license, or are on the waiting list. You’ll see the computer name, OS, last known IP address, last check in date, and the status of the machine. Under “Status”, you’ll see either “Active”, indicating that the computer has correctly consumed a license, or “Waiting List (Check in overdue)”, which indicates that the computer attempted to consume a license, but there were none available.